This is to those who think honor is killing someone who offends you. This is to those who think killing someone who expresses his basic freedom of speech can be rationalized, those people who are the worst kinds of the kinds, the people who are even more dangerous than the terrorists who actually kill. This is to those whose skin is so paper-thin a joke proves to be too much for them to handle. This is to those who think their religion tells them they should kill, who think they have the right to take a human life. Because no one should die for freedom of expression. 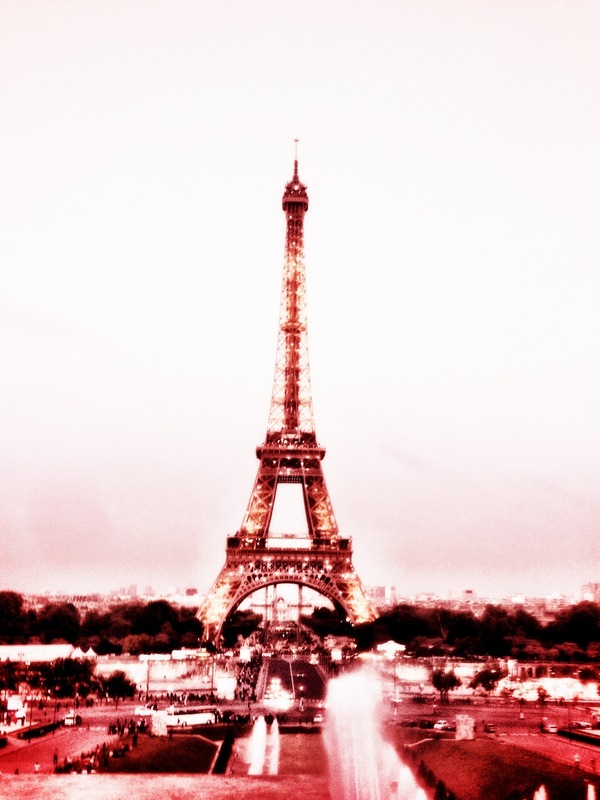 We may be used to death and horror where we live, but that’s no excuse not to feel disgusted and horrified at what happened in Paris today. Because the best thing we can do now is to express ourselves unlimitedly, and because publications in my country may prove to be too cowardly to publish these, I present the many covers that got narrow-minded bigoted cunts to kill 12 innocent souls in France today. 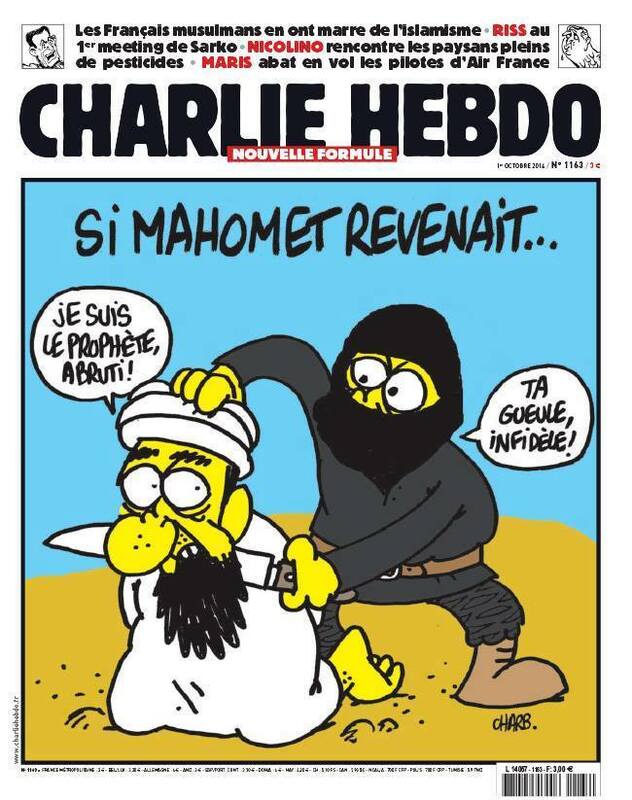 From Beirut, this is Charlie Hebdo. 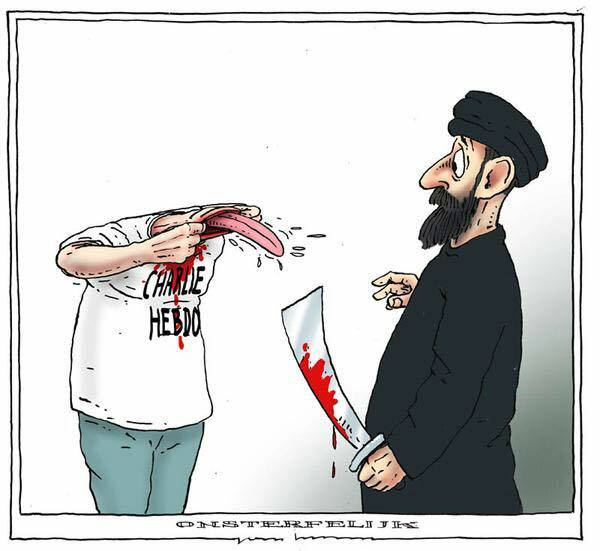 In 2006, following the uproar over the Danish caricature of the Prophet Mohammad, Charlie Hebdo republished the pictures in an issue, to the outcry of many, and to the lawsuits of others. 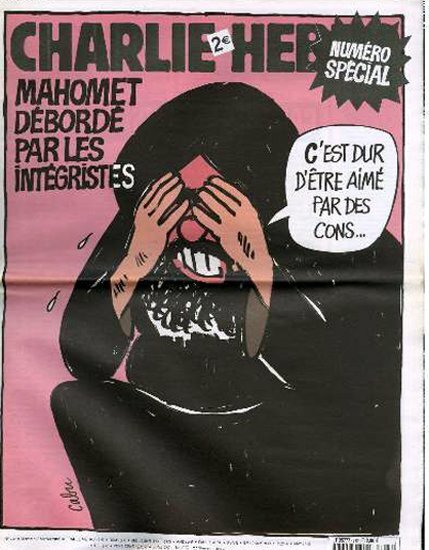 Following the ban of the Burqa in France in 2010, Charlie Hebdo came out in support of the decision. In case people thought their title of this issue was open to interpretation, they illustrated it very clearly. 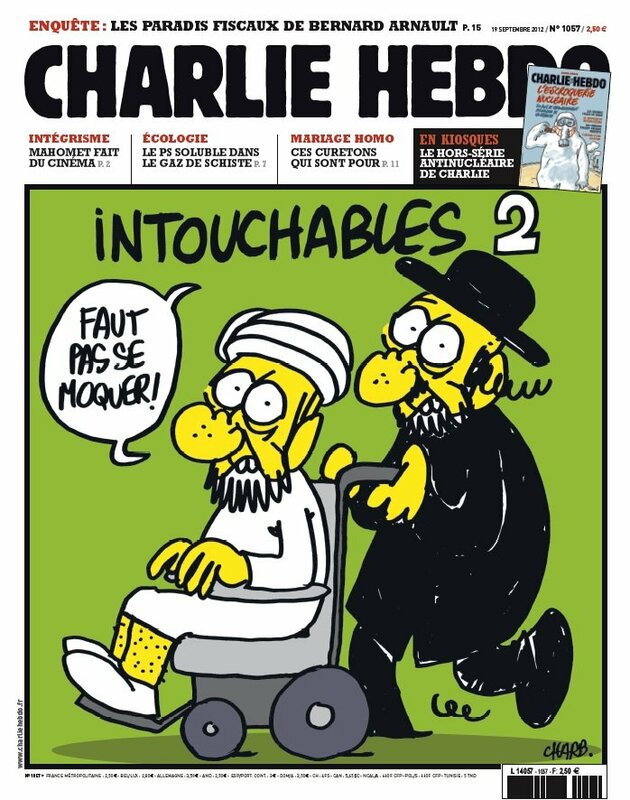 In 2012, following the release of “The Innocence of Muslims,” Charlie Hebdo released this spin over the then-widely popular French movie “Intouchables.” The issue also had several caricatures of the Prophet Mohammad in various compromising positions. Needless to say, threats against them and against many French embassies rose to stratospheric heights. 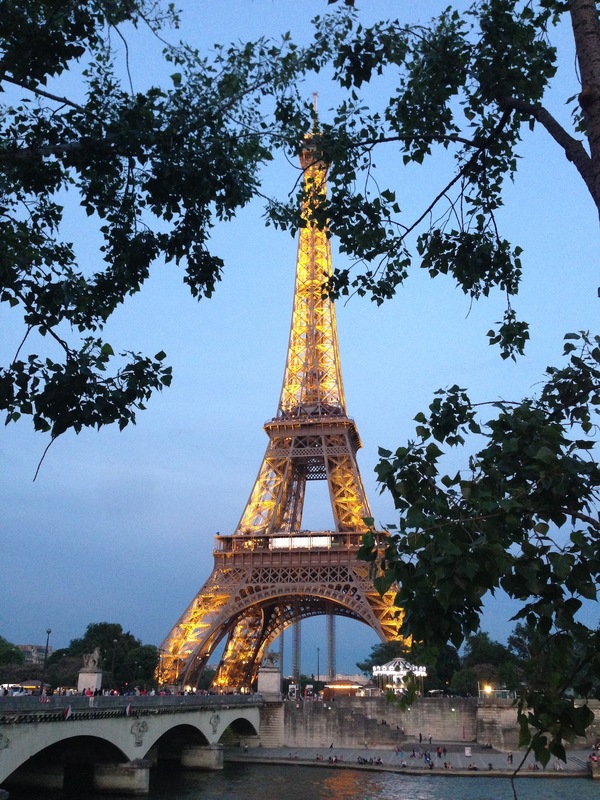 As a result, French embassies and cultural centers in many countries were forced to close. 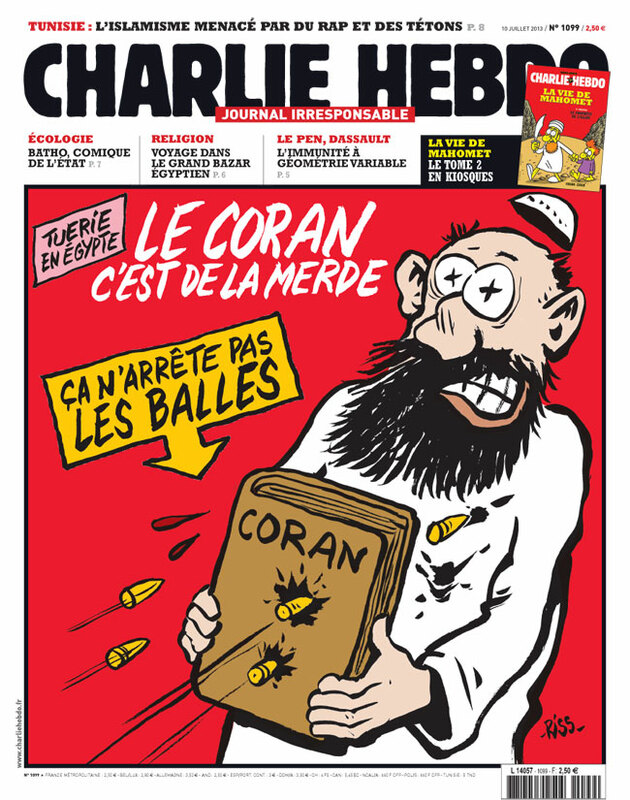 In 2013, to comment on the crackdown on Islamists in Egypt, Charlie Hebdo wrote an issue in which they made fun of those Islamists for finding the Quran not to be as “bullet-proof” as they once thought. 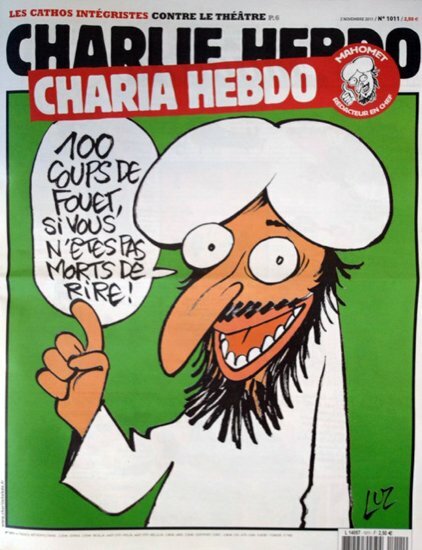 In October 2014, to comment on the rise of ISIS and their video-taped public executions of many foreigners and locals alike, Charlie Hebdo published a cover depicting what most people around the world know about the terrorists: that they have nothing to do with Islam. Of course, everyone knows this but the terrorists themselves. 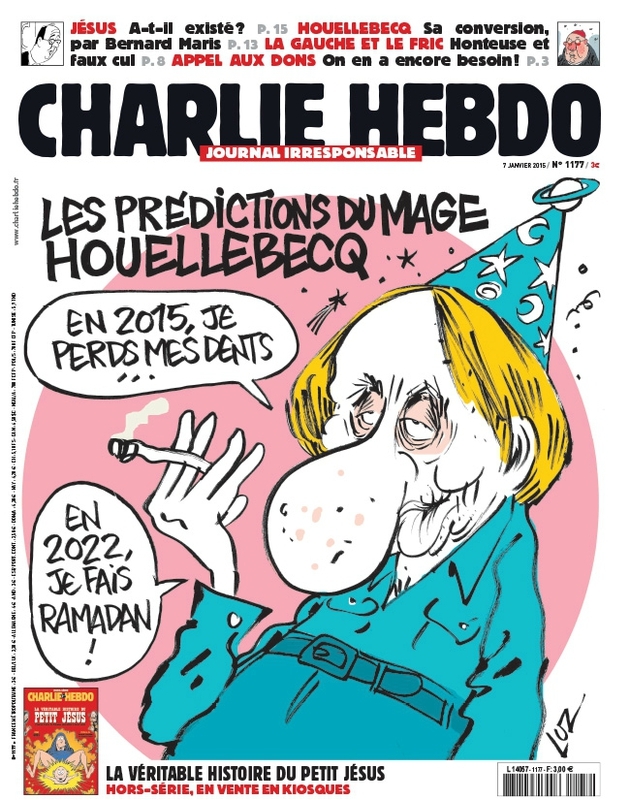 To comment on the rise of Islam in France, Charlie Hebdo’s first issue of 2015 was a satire on how come year 2022, France will start observing Ramadan as a regularity. I suppose this didn’t such very well with some of the masses. May all the artists and visionaries at Charlie Hebdo who lost their lives today rest in peace. The world will remember them forevermore as the brave people who drew their pen to those who drew a weapon at them. 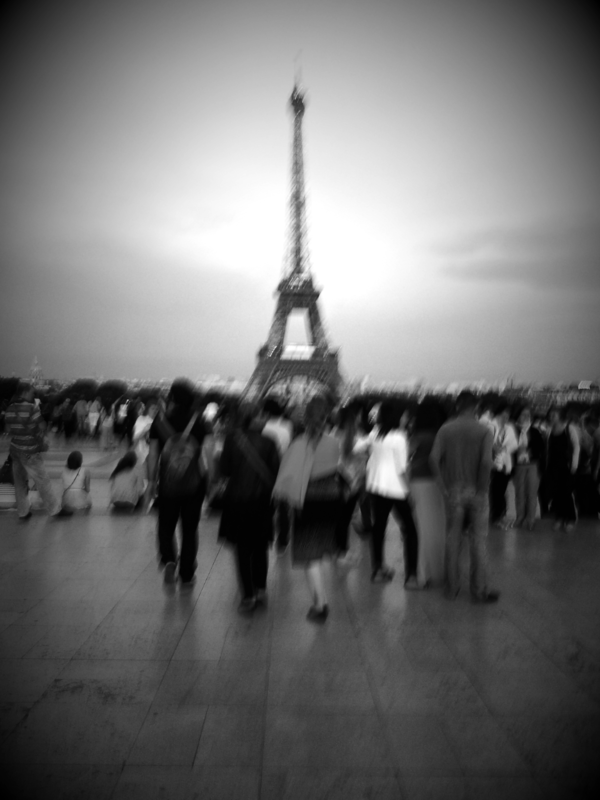 And there’s no better memory to leave to an unjust world like ours today. It was grating at first. Then it became amusing. There was really nothing I could do to change what those people thought of me or my country or everyone who had my passport. 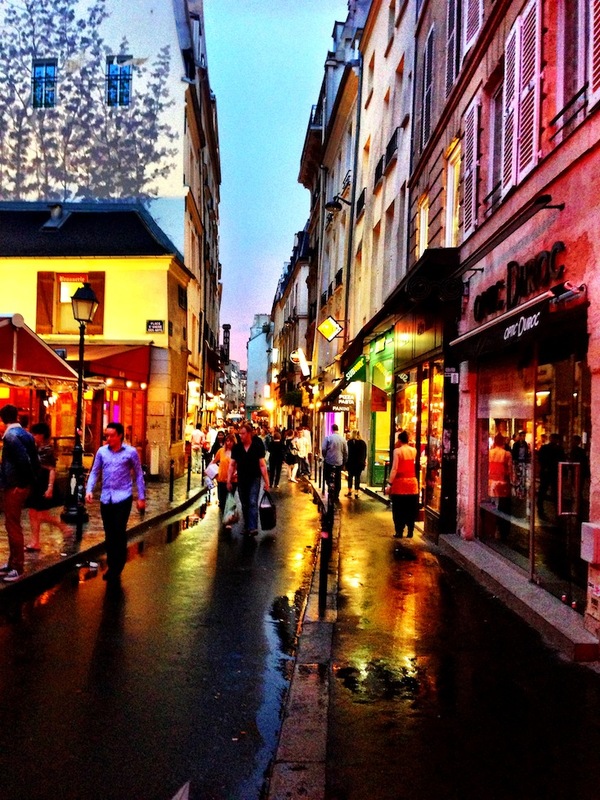 It’s not only the French, it’s basically everywhere else as well. And we try to pretend as if the stereotype isn’t there but kidding ourselves is all we do. I’ve been pondering for a while over why is it that the Lebanese candidate Anthony Touma on France’s The Voice managed to instill a sense of nationalism among us, one that doesn’t necessarily reflect the same way by the French over the French candidates on the show. In more general terms, because Anthony Touma isn’t a lone example, why is it that we cannot not be proud of the Anthony Toumas of Lebanon, no matter how hard we try and knowing that they may not be the absolute best at what they do? Why do we feel wronged when they get wronged? Why do we, as Lebanese, feel involved in what they do and what they accomplish fully knowing that the benefits they reap don’t reflect on us in any way? I am not the type of Lebanese people who gush over the Shakiras and Salma Hayeks who never set foot here and yet some people feel obliged to try and get them to identify with us. But when I look at Anthony Touma, Amin Maalouf and others, I see people who are like me, who lived my life, who probably went to schools similar to mine, who walked the same streets that I walk everyday and who are doing the best they could with the talent they have. The Anthony Toumas of Lebanon are the people who, with each word they write or each note they sing, give a better image of our country than we could ever do. And some might believe we don’t need that. But we do. We terribly do. Our sense of nationalism as Lebanese kicks in often because we have something to prove. We want to prove that we can do better, that we can be better. We want to prove that this small nation can give the world great gifts. We want to prove that the confines of the 10452 km2 don’t limit us. We want to prove that war and violence and absurd politics don’t bring us down. We want to prove that we can rise above the terrible hands we are dealt on daily basis. We want to prove that this small Middle Eastern country has something to give and give well. For many, those prospects are never self-fulfilled, which is okay. We are not all given the same chances in life. But when we look at Touma, Maalouf, Gebran, Nadine Labaki, etc… We see people who are trying to make it or have made it. And they give us hope. And those people who walk and talk and think like us make us proud. 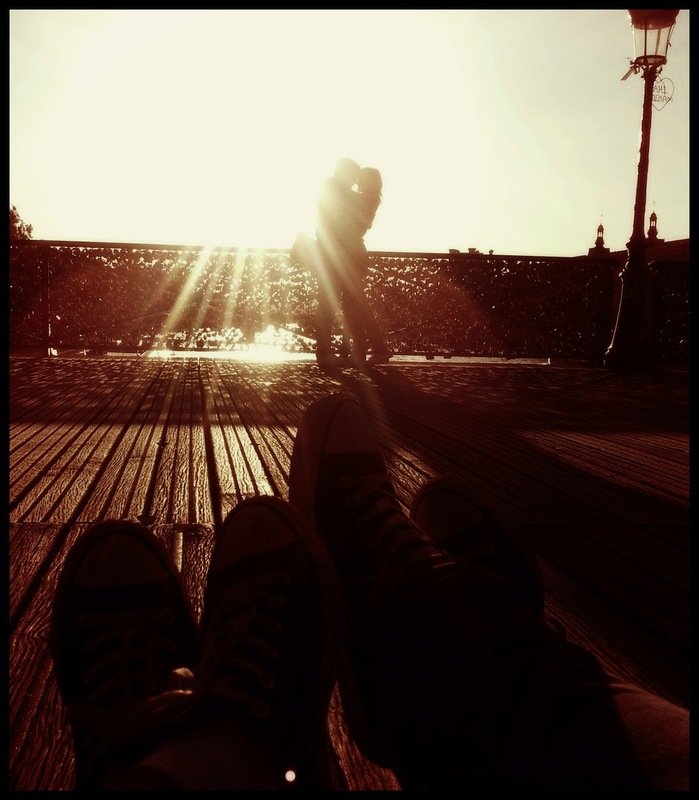 There will come a time, hopefully, when we no longer feel we have something to prove to the world. Perhaps our sense of nationalism towards the Anthony Toumas of Lebanon lessens when that time comes. But until then, there’s nothing wrong with feeling proud of our countrymen who represent us despite everything and represent us well. Or you can hate on them because feeling proud of someone because they’re Lebanese is just too non-scientific and mainstream. After a successful run on the second season of France’s The Voice, the Lebanese candidate Anthony Touma lost in the show’s semi-final to Olympe. Despite winning the public vote with a huge margin: 59.7% to 40.3%, Anthony Touma only got 15 points out of the 50 allocated to his coach, which seems fitting enough since 35 points was all it took for Olympe to beat out the Lebanese candidate by 0.6 points. I find the way Anthony Touma lost to be quite fishy. It’s strange how all the other judges awarded their 50 points in a more balanced manner (26-24) except Jenifer who decided to go as lopsided as she did. And it’s strange that, after having lost the public vote twice consecutively to Olympe, Anthony Touma would come back to win with such a wide margin. It all feels very calculated and fishy. 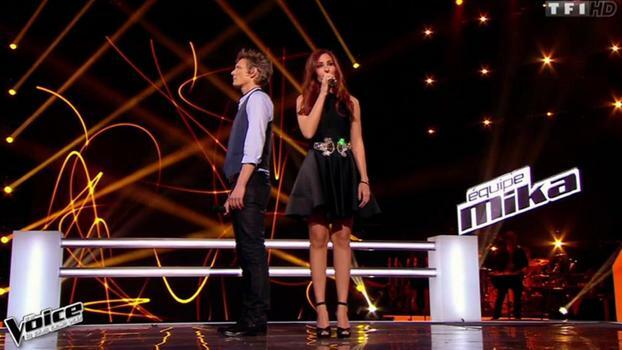 Perhaps they didn’t want a non-French to win the second season of France’s The Voice? I don’t think Anthony Touma is a talent that knows no match. I think he’s slightly overrated but I’m still immensely proud of what he’s accomplished. Good luck to him in his future endeavors though it seems he doesn’t need them. 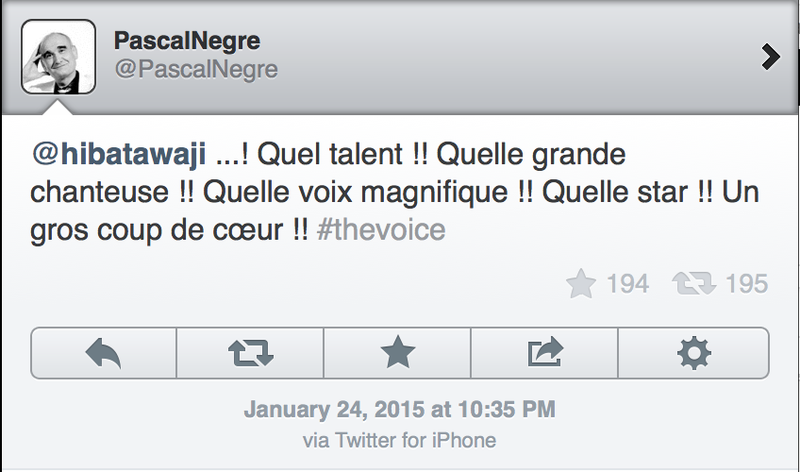 Pascal Nègre, CEO of Universal France, already wants him to sign a record deal. This is Anthony Touma’s performance at the semi-finals with “Les Mots Bleus” with the results in question (link). 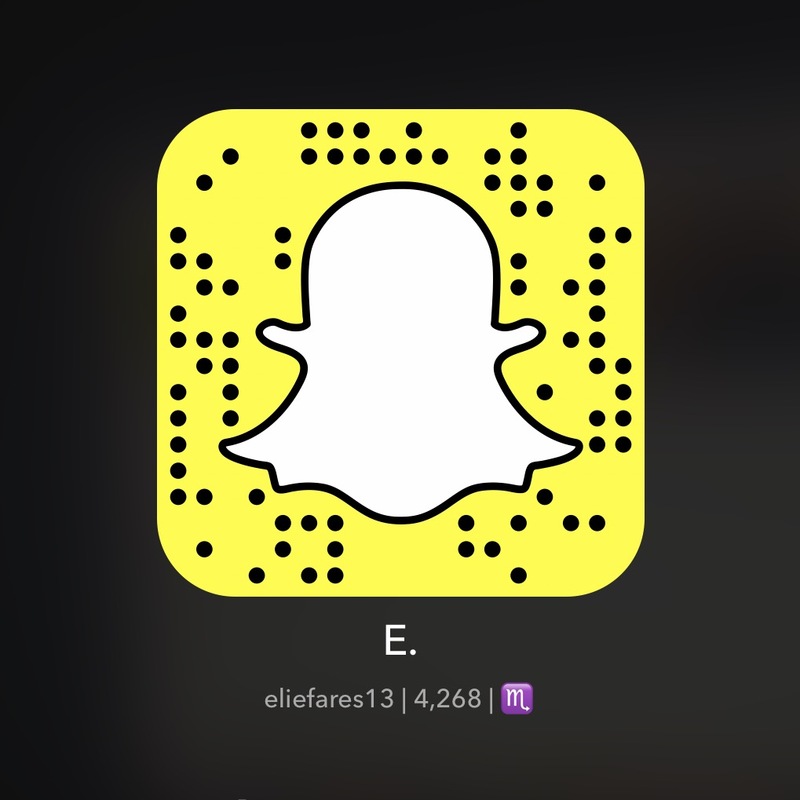 Posted on April 3, 2013 by eliefares Tagged BeirutCarrefourFrancegroceryHazmiehLebanonLilleParisSpinneys	Comments12 Comments on Carrefour Lebanon’s Tough Path To Success? Carrefour Lebanon’s Tough Path To Success? 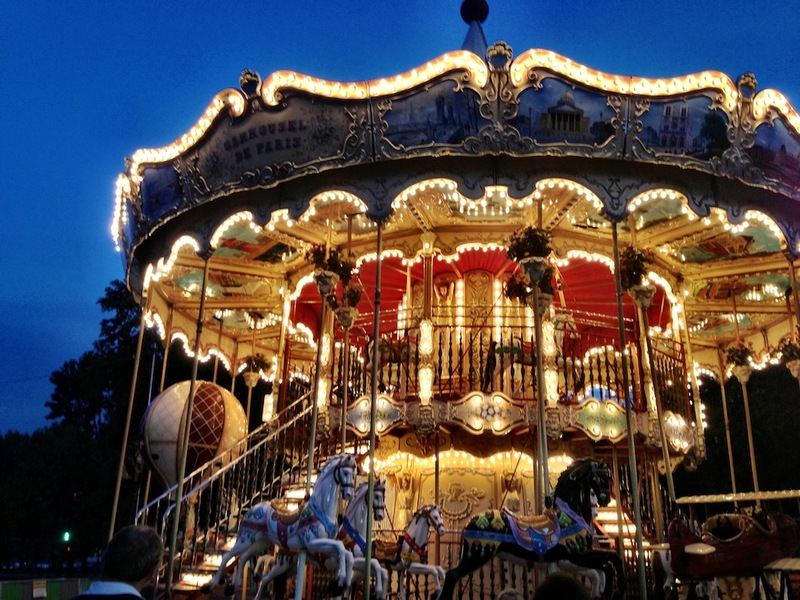 Carrefour was one of the simple pleasures of my life in France. 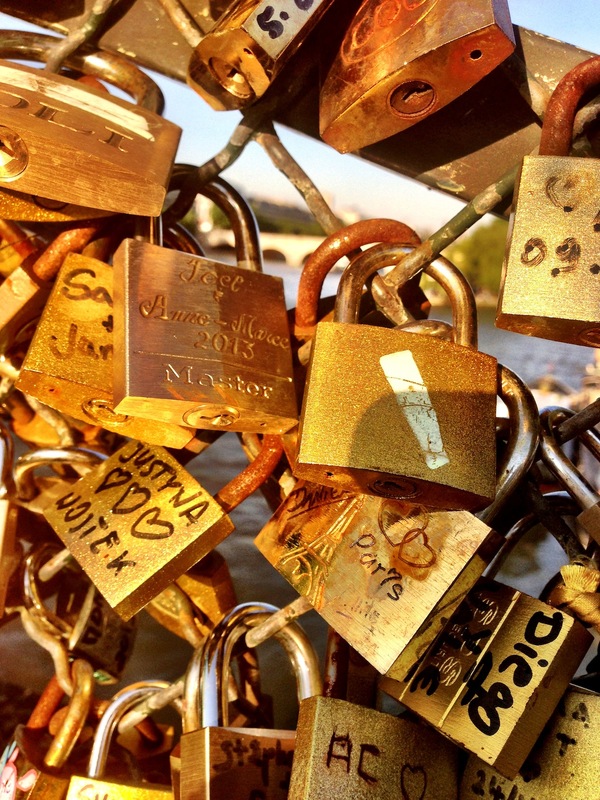 It was close to my apartment – a two minute walk. I would find everything that I needed among its not so numerous shelves: the place was as small as a mini-market in Lebanese standards. Carrefour also represented an entire shift in my thinking paradigm when it comes to grocery shopping. For starters, they didn’t offer plastic bags for your purchases for free. I no longer needed hypermarkets to find mundane things I had come to believe only existed there. But most importantly, it made me deviate from buying the brands I had grown used to in favor of its own offering: the brand Carrefour. Let’s take a simple example: fruit yoghurt. 12 Carrefour little packets of the substance cost €1.23 whereas half that amount of other brands such as Danone or Nestlé cost at least 3 times that much. This quickly perpetuated to my purchases of my entire grocery: from cheese to bread to toilet paper. The amount of money I was saving up because of that kept me from thinking about any potential difference in quality which I frankly didn’t even encounter: the brand Carrefour offered stuff which were equal if not sometimes better than the more expensive alternatives. Is Carrefour overdoing the marketing blitz? Definitely. How so? 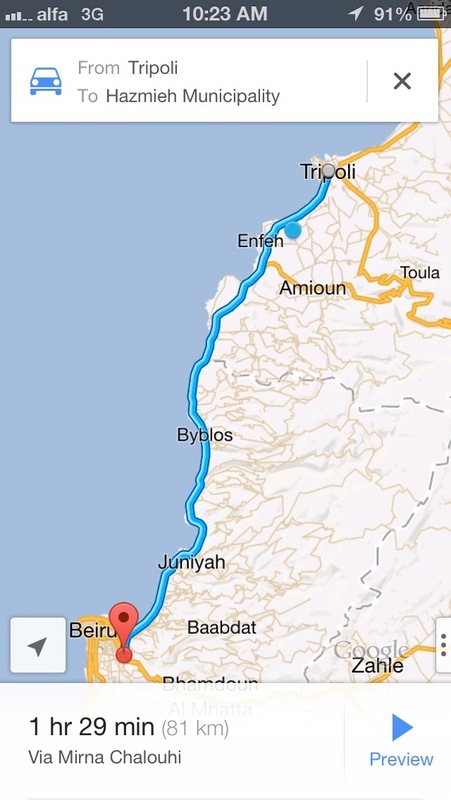 Well, ask yourself this simple question: regardless of how much money you’d be saving, would you be willing to drive 81km in Lebanon in order to buy grocery? But that’s not the major hurdle Carrefour will be facing in Lebanon: it’s getting an entire country to have the paradigm shift I had when I stayed in France, something that other brands tried to do and failed. Spinneys, for instance, does the same thing Carrefour will be doing in a few days: it offers its own tissues, its own grains, soda, chips, etc…. But people rarely buy them because we, as Lebanese, have somehow associated the cheapness of the brand and the fact that it isn’t as trustworthy compared to others with it not being good enough. 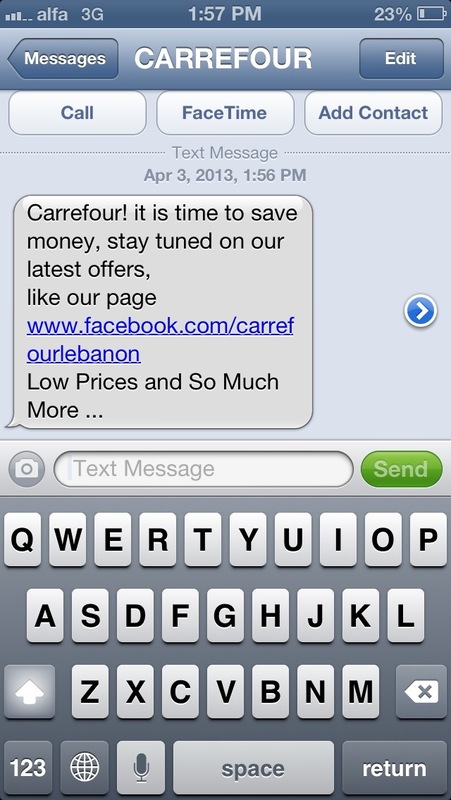 Carrefour, which is sending text messages to almost everyone in Lebanon, will not be cheaper than any of their other already present alternatives if people refuse to buy its brand which begets the question: will it be any different and do we really need another chain in the country? Besides, will the Carrefour brand be cheaper than what the market currently offers? For instance, will Carrefour yoghurt be cheaper than the one Taanayel offers? Or will it feature a price hike because it’s “signé” and imported from “Paghis” à la Paul and Fauchon and other French outlets in Lebanon? Moreover, the success of Carrefour in Europe stems from it being accessible to everyone through small shops like the one I described previously. Few are the Carrefour hypermarkets across France but many are the mini markets, which makes any customer’s shopping experience more personal and less hectic. In fact, the entire city of Lille, France’s 4th in size, has only one major Carrefour store in the city’s main mall Euralille. However, it has dozens of smaller Carrefours spread around the city and its suburbs offering almost the same thing. Will Carrefour adopt the same approach in Lebanon? Or will it be the same thing all over again: spreading across the country in huge chains that won’t offer anything different from what’s already present? If Carrefour wants to spread in Lebanon and offer a true alternative to the Lebanese, shouldn’t it start differently from what others did and not follow up with the current trend of you finding everything you need in malls only? If Carrefour moves to Tripoli for instance, it will have a very hard time battling it out for market share with the wildly popular Spinneys. But if it offered smaller shops around the city, then people might end up making it their go-to place. Perhaps market research showed some room for an alternative. But I don’t think the alternative is necessarily another grocery chain but a whole new approach to what’s already here: to get people to buy cheaper and equally good products, make things more accessible and make them need driving from Achrafieh and nearby Spinneys or TSC to said alternative. I don’t think Carrefour will do that in its present form.